1. If only need to work in the day, it just need the solar panel and connected with the pump. Do not need controller and battery. Please refer to the above information, the open circuit voltage of the solar panel is about 36 V, the water flow will changed according to the sunshine. 2. If the pump is needed to work at night, its need to connect solar controller and batteries and other related accessories. 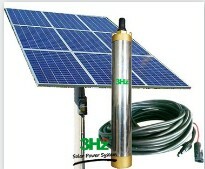 That is the off-grid solar water pump system.